The size of your company database has a direct impact on the amount of time required to synchronize data to the mobile application and on the application performance itself. The following document outlines the scope of impact by database volume and device, how database volume can be viewed, and actions that can be taken to improve data usage, sync performance, and application performance. The following chart shows data synchronization time in minutes:seconds (mm:ss) at different volume loads of Activities. Note: iOS is faster than the equivalent Android device when performing a sync, as iOS uses a proprietary binary format which is more efficient. Background apps and processes running on a device will impact full-sync performance. This generally includes apps such as maps, navigation systems, music players, etc. In order to determine the efficacy of remediate action, you will need to establish a baseline. Navigate to Settings and select Contact Support from the action menu (⋮). If you don’t wish to send an email to SAP FSM Support, select the Cancel option from the top. Note: Business object counts viewed from the mobile applicaiton take into account both user permission settings and relevant company settings. 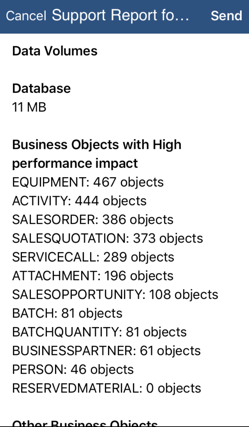 Company business object counts can be viewed using the Query API tool located in the Admin Module. Here, Activity can be replaced by another business object to return a count (example: BusinessPartner). Note: To return a count for a specific account (such as a technician), you could use an API management tool such as Postman and pass the account credentials into the request sent to the Query API. The following actions can be taken to improve performance and synchronization times. Permissions can be applied to users and business objects to further customize behavior and improve performance. 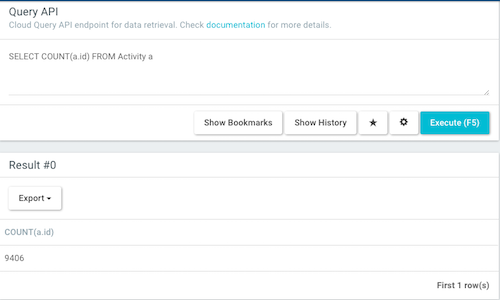 For example, a user could be assigned Read permissions for their Own Activities, filtering out activites that are assigned to other employees. Data Sync Rules can be applied to determine what data is stored in the mobile app when in "offline" mode. Permissions and permission groups are viewed and managed in the User Groups screen of the Admin application. Operation Permissions determine what records users can CREATE, READ, UPDATE, and/or DELETE. All By selecting, the permissions settings will be available for all users associated with the given permission group. For example, if you applied Read on Attachments and assigned it to All, you would be able to read/view all attachments. Own By selecting, the permissions settings (example Update on Activity) will be available for all users associated with the given permission group. For example, if you applied Update on Activity and assigned it to Own, you would be able to update your own activities. None By selecting, the permissions settings (example Delete on Quotations) will be available for no users associated with the given permission group. For example, if you applied Delete on Quotations and assignted it to None, you would be unable to delete quotations. If you check this box, the Activities module will appear in the menu of SAP Field Service Mobile. If you do not check this, the Activities module will not appear in the menu of SAP Field Service Mobile. However, Activities linked to a Service Call, for example, will still appear. If you check this box, the Business Partners appear on the Workforce Management Map. In the User Groups tab of the Admin module, you can view and manage the User Groups and Data Sync Rules for your company.